The storage industry is facing a transformative shift away from traditional SAN- and NAS-based architectures, to a software-defined storage (SDS) approach. In fact, according to research by IDC, 60% of firms are committed to SDS. But why? The adoption of SDS is being fueled by cost reduction, automation and vendor lock-in objectives. How can your enterprise simplify your SDS adoption? 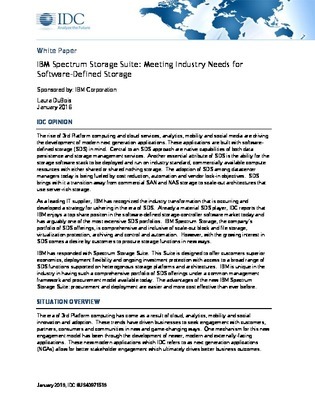 This report highlights a portfolio of SDS offerings that offer a broad range of functions supported on heterogonous storage platforms and architectures. Access now to see how you can easily deploy an SDS platform and automate your storage management and operations.